When John Boland and James Carroll purchased The Paper in 1989, it's fair to say that the newspaper industry was a whole lot different than it is today. The web was still five years off and the idea of a "digital presence" for newspapers was limited to text-based terminal services like Prodigy and Compuserve. Boland, a Sebastopol resident and president and chief executive officer at KQED (he's stepping down at the end of 2019), recalls that when he purchased The Paper, its office was in a dungeon-like space in Forestville. He and Carroll relocated to Freestone and converted a general store that was already there, into half–newspaper office, half general store. The Paper, the Stump and the Independent—the DNA of pubs that birthed the Bohemian in 2000—were very much West County papers, Boland says, but in 1992 a business decision was made to move the newspaper, by then called the Independent, to Mendocino Avenue in Santa Rosa, at which point it went to Sonoma County-wide distribution. At the time of the move, says Boland, the paper was being published twice a month, but once they moved to Santa Rosa, "things really improved and took off," he says, recalling fun times when he and Carroll would forgo paychecks to help keep it all afloat. "When we bought it," Boland recalls in a recent phone interview, "we thought it didn't need to be mainstream, but needed to be a more accessible alt-weekly." He says they looked at the Village Voice and San Francisco Bay Guardian alt-weekly models for guidance, and said, "Let's take it a little more in that direction—do arts and entertainment, but also investigative journalism." Those two big-city weeklies have both bitten the dust in the digital era, an irony that's not lost on Boland or anyone else with an interest in the history of alt-weeklies and why some have made the transition while others have folded. One striking thing about The Paper, the Stump and the Independent is that they were alternative-leaning weeklies published in a rural area, making for some difficulties on the revenue-generating end of the deal. But West County was, and still is, the alt-soul of the North Bay. Back then, says Boland, "Sebastopol was definitely known as Berkeley North." Reflecting on the business aspect of running an alt-weekly in farm country, Boland says, "It's always been a struggle, and particularly in a less populated area like this, as compared to a populated area." A true labor of love, he and Carroll "depleted savings," he says, and "borrowed money from relatives." The history, in brief: the Stump's offices were in Monte Rio, and as Boland describes it, the paper was "very much a Russian River thing." It became The Paper in the 1980s, when Nick Valentine was both editor and the graphic designer. "It was kind of known for its very alt, almost underground content, and for his graphic designs." Guerneville was originally known as Stumptown because of all the logging that went on in the 19th century, he explains. By the time Boland and Carroll purchased The Paper, Valentine had left and Tom Roth was the editor. The paper's editorial was then focused on Sebastopol, Bodega Bay and the Russian River communities, even as it served all of West County, notes Boland. In 1994, Boland and Carroll sold a majority interest in the newspaper to fellow Bay Area alternative publisher Metro. Boland stayed on as a board of director member of Metrosa, Inc., retaining a 12 percent ownership in the publication that continues to this day. 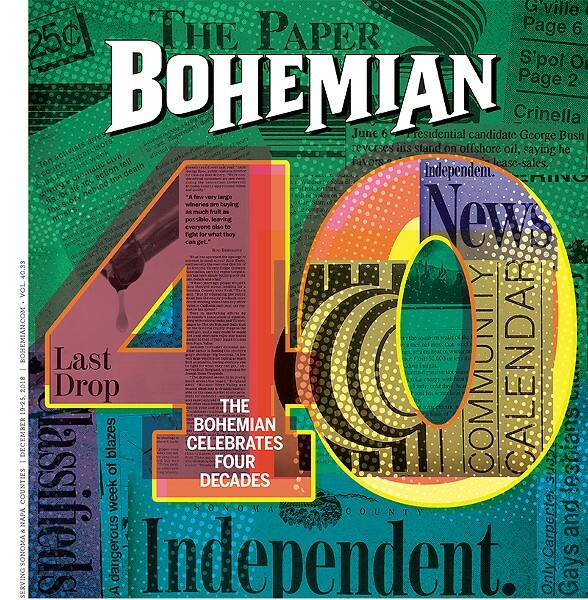 In 2000, after publisher Rosemary Olson sought to expand circulation to nearby counties, the newspaper became the Bohemian. Anyone in the newspaper business these days knows there's a strangely liminal dynamic afoot: thanks to the advent of digital content, print advertising doesn't carry the weight among local businesses that it once did. At the same time, it's tough for newspapers to ramp up online revenue, given that most of the revenue from ad sales online goes to either Google or Facebook. Boland's got a vision for the industry and sees a way out—or through—with the advent of journalism outlets that don't rely on advertising.